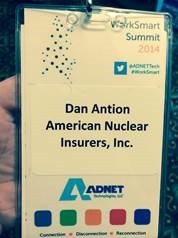 Sorry for the little play on words in the title but I spent an amazing day on Thursday at ADNET Technologies annual WorkSmart Summit. ADNET is a technology services and training company and WorkSmart is simply one of the best educational experiences of the year. Did I mention that it was free? Yeah, it was free. Free usually means supported by vendors and that usually means that you have to sit through have the opportunity to attend a bunch of scripted commercials presentations by those vendors – NOT at WorkSmart. Some vendors did offer presentations, but they were focused on helping us (the customers) to understand a bit of technology, not to hear about their product. One of those presentations was by the morning keynote speaker, Bob Lincavicks who is a Technology Strategist with Microsoft. The title of Bob’s presentation was “The Evolving Future of Productivity” and although he gave himself numerous opportunities to talk about Lync and Exchange and SharePoint, he didn’t. Oh, he mentioned the product names, but no commercial. Bob talked about concepts, history, The Jetsons (and flying cars) and people (and flying cars), I think if Microsoft ever makes a flying car, Bob should be the head of sales. 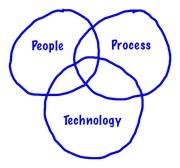 At one point in his presentation, Bob showed a Venn diagram relating People, Process and Technology. Two things came to my mind. First – I love Venn Diagrams. I do. I freely admit that if you can package your concept into a Venn diagram, you are going to have my attention. It goes back to the whole New Math thing; I was a sucker for New Math. Second – Think about it – people, process and technology – if there was ever a stepping stone to a SharePoint sales pitch, that was it. Bob stayed the concept course and he gained my respect by the moment. So, I’ll make the pitch for Microsoft. Productivity requires that you pay attention to people, process and technology. Technology alone won’t do it. Despite the modest success I had early in my career as a Methods Analyst, process improvement alone won’t do it. People, even those who work hard to be productive, can’t get there alone. It takes all three. It takes all three, and when attention is paid to all three in SharePoint, you can deliver some serious support for productivity. SharePoint can be made to work with people. That sounds obvious, but so often it isn’t. SharePoint out of the box isn’t always a people pleasing experience. On the other hand, with just a little attention to detail, SharePoint can move close enough to being an intuitive experience that people can thrive in the environment that the platform supports. I’m not talking about hundreds of hours of work to make SharePoint “not look like SharePoint,” I’m just talking about enough time and energy to increase the area of intersection between people and process. Sometimes all you have to do to accomplish this is to get rid of the links to stuff you’re not using and reorganize the links to the stuff that you are using. Process is SharePoint’s happy place. Often, when I look at a SharePoint solution that has been in use for a while (without review) I can almost hear SharePoint saying “you know I could do that for you…” SharePoint can do so much, and just like with the look and feel of a SharePoint site, it doesn’t have to be national railroad scale process. We recently put a 5-action SharePoint Designer workflow in place to eliminate the need for people to remember a bit of process. “Too many people are forgetting to do this.” Ok, how many people are thinking about the “Dr. it hurts when I do this” joke? Seriously, somebody had that complaint and the apparently not-so-obvious answer was to let SharePoint do it. Of course, you can’t have SharePoint without technology, but even the people who are comfortable with SharePoint forget that SharePoint exists within an expanding universe of technology. We are a relatively small company but I’ve written about SharePoint going mobile, SharePoint running on an iPad, SharePoint augmenting the process in otherwise fat-client applications and SharePoint providing the electronic shelving for critical document libraries. SharePoint can support the intersection between people, process and technology and the resulting union (you’re going to have to look those up if you don’t remember) can be a very productive place. Wow, has anything ever attracted as much attention as Microsoft’s decision to kill a mediocre product? My inbox is full of “InfoPath is Dead” and “Microsoft is Killing InfoPath” emails. I’ve seen Tweets, Facebook posts, invitations to join discussions on LinkedIn and invitations to attend Webinars practically every single day since the announcement was made. I get it! InfoPath will die in 2023. Guess what, I will retire before then. 2023 – 2014 = 9 Years – Seriously, 9 years! That’s a long time. It’s not like “ding dong the witch is dead; click your shoes and go home.” The metaphorical Dorothy will be old enough to drink by the time she gets back to Kansas. We made an investment in InfoPath, and well before 2023, we will have achieved a return on that investment. That is what we are supposed to do isn’t it? What’s on Other Roadmaps? – I realize that there are other ways to publish and process forms. Some of these alternatives are every bit as good as InfoPath, many are superior. If you made me choose a new forms platform today, I would probably start by taking a hard look at Nintex. We use Nintex’s workflow product and I imagine their form product works well too. That said, what’s Nintex’s plan for the future? Will Nintex Forms exist in 2023? Will the forms we produce with Nintex Forms today still run in 2023? Well, we really don’t know. In terms of vendors you can trust for the long haul, there really aren’t many. It’s not like they are untrustworthy, but what company can really say that they and their products will be here in 10 years? HP? Dell? BlackBerry (RIM)? Kodak? Go back 10 years and think about how those guys looked at the time and then consider how they look today. If you’ve been reading this blog, you might be surprised to see me say that I trust Microsoft, but when they say that they put something on a long, supported slide to the back door, I think we can believe them. Support and Compatibility Questions Abound – Sure they do, but when haven’t they? Microsoft says that InfoPath 2013 will be the last version and support will end in April of 2023. As far as I know, they didn’t actually say that InfoPath 2013 and SharePoint 20nn will be compatible, but I’m not going to worry about that. Let’s assume that the next version of SharePoint is the 2016 version (I know they want to stop the “big release thing” but humor me). Chances are good that SharePoint 2016 will be compatible with InfoPath 2013. Chances are also good that we could run SharePoint 2016 until 2020 (we’re still running SharePoint 2010). Since we know that InfoPath is on a collision course with the trash bin in 2023, I’m pretty sure that my successors will have an alternative in mind before 2020. I don’t think they will be building any new InfoPath Forms in 2018-2020, but I think we can safely build them in 2014-2016 and still get that ROI. No Certain Migration Path – In other words what if Microsoft creates a new Forms product and we can’t convert our InfoPath forms to that product. Well, that would be dumb. If Microsoft wants to play in the forms arena, they would be silly to alienate their previous forms customers. Still, since we know that Microsoft is capable of doing dumb things, I’ll accept this as a possibility. On the other hand, you have to ask: is there a way to migrate one forms product today to another forms product today? I am assuming that if we wanted to move to Nintex Forms today, we’d be recreating the functionality of our InfoPath forms on that platform. That’s OK. Also, that’s really the worst thing that can happen to us, that in 5-7 years we will have to recreate a form that probably will be due for a major update anyway. A member of my team will be at the SharePoint Conference. We will hear about the future of InfoPath from the horse, and we will plan or adjust our plans accordingly. In the meantime, I’m not losing any sleep. Maybe I’m missing a verb in the title, or maybe “to SharePoint” has meaning, suggests action of a sort or at least makes a few of us shake our heads. I left out the verb, because I’m not sure what the right one is. How do you “use” SharePoint, “get rid of” SharePoint, “stop bad SharePoint sites from spreading like kudzu?” “get the most out of” SharePoint, “teach people how to use” SharePoint, and so on. Do you have answers for any of those questions? Do you live in New England? Can you spare some time on Wednesday, November 13th? There’s a lot of questions, but if you can answer a few of them, join some of your New England neighbors in Cambridge, MA on the 13th – share a snack, share some coffee and share your answers, or at least your reactions. On November 13th, the New England Chapter of AIIM (AIIMNE) will hold our second educational event of the program year and, no surprise, it’s focused on SharePoint. In case you aren’t aware, AIIMNE is doing events differently this year – well sort of differently. AIIMNE events have always been fairly lively, with a healthy amount of audience participation. This year, we decided to tap that energy and add some value for our members in the process. Each event is organized to encourage that audience participation and we are then publishing a white paper from the event. To get an idea of how this works, check out the white paper from our first event, where we focused on handling secure and confidential information amid an always connected always sharing workforce. Go ahead, download that report, it’s free and we aren’t even asking for your email address. For this next event, we arranged for Marc D. Anderson, Co-founder and president of Sympraxis Consulting, Derek Cash-Peterson from Blue Metal Architects and Russ Edleman, president of Corridor Company to join us to get things started. Between them, these guys have seen just about every kind of SharePoint or SharePointery there is (hey, if we’re making up words). Steve Weissman, President of the Holly Group will be on hand to facilitate the discussion, should that be necessary; our audiences have a tendency to fire at will. Not to worry, our speakers are adept at crowd control. What’s the goal? Well, besides gathering fodder for our next Event Experience report (as we call them), I hope to learn something. I hope to hear about ways of using SharePoint that I haven’t considered. I hope to return to work on Wednesday afternoon with a head full of ideas that will keep me busy until the next SharePoint event. I’ve heard some of these guys speak before, so if I’m going to get a head full of new ideas, I need you to be in the room. I want to hear your SharePoint Story (ooh, there’s a catchy name). If you’re planning to join us, we will be at the Microsoft building at 1 Cambridge Center. It’s the one in the picture up in the corner. 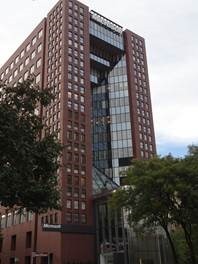 It’s not the building at 1 Memorial Drive. It’s a great facility and the Chapter truly appreciates being able to use it. We will also be using Microsoft’s Internet connection so if you can’t be in Cambridge, consider joining us on-line as we stream the event live. We stream a mix of presentations and video and we do our best to submit the comments and questions from our remote audience into the discussion in the room. You can read or share this event with others at the Chapter website, and if you are ready to sign-up, you can do that over at Eventbrite. But wait, there’s more. If you register by November 1st, enter the discount code “sharepointstories” and save $5. Thanks for reading! We have all talked about, read about and many have written and presented about the fact that every SharePoint question can be answered with “it depends.” Well, I’m adding another question to the heap, the one in the title. As I look around the pile of SharePoint notes on my desk, I find references to several systems that are done. They are done, or they were done, or they are never going to be done, I’m not really sure, but I’m also not adding a sad-smiley here. There are several reasons that SharePoint is kinda-sorta never done, and they’re all some of them are good ones. SharePoint Changed – We have features in SharePoint 2010 that we didn’t have before, and this made us want to change some sites. A good example is Document Sets. We waited until we had SP2010 to build one site, because we knew Document Sets were coming. After building that, we found a few other places where Document Sets would work well, some have been changed; some are on that list on my desk. Managed Metadata is something else that is spreading like Kudzu. As we look ahead to SP2013, we’re happy to hear that loops are allowed in workflows, but we’re also thinking about bigger changes, like moving some sites to the cloud. The fact that SharePoint has changed, is changing and hopefully will continue to change is a good thing. As long as Microsoft doesn’t forget that people are using the features they baked into the earlier versions, there should be all kinds of happiness in the future of SharePoint. Content Changed – Considering that we are a business that does one thing and that we’ve been doing it for almost 60 years, you wouldn’t think that much changes in the world of our content. Well, change is relative. Our content might be changing at a glacial pace, but some things are different. I mean we are no longer filing onion-skin copies of endorsements (you young kids go Google that). More important are the changes in the way we look at content. Some of these changes are driven by new people who are more comfortable with information. Some are driven by new priorities that make us want to ask harder questions. Some are driven by the connect-the-dot effect of SharePoint. As we put more content into SharePoint and add metadata that lets us find it easily, we start to see connections between what we first imagined to be disparate silos, and we start to see value in making more connections. We Bought Something – We haven’t upgraded to SP2013 yet, but we did purchase Nintex Workflows, and that product gives us the ability to loop through a list. Initially, I didn’t think we would go back and tear down any of those three-part bank shot multiple lists and workflow combination solutions that force SharePoint to iterate over a list, but maybe we will. Earlier, we bought HarePoint, which made it easier to connect to our workflows to data in SQL Server (among other things). This means we can expose more data on a SharePoint site, including some sites that are were done. Something Broke – Yeah, this is the one I added that caused the strike-out in the first paragraph. I know Microsoft hates it when people talk about problems, but things do go wrong in SharePoint. One of the biggest things that went wrong for us is a site that thinks 90% of its metadata is defined twice. 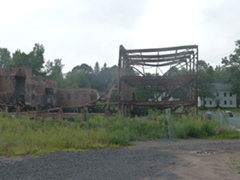 We aren’t sure what caused this, but all indications (as well as all Googling) tell us that the only solution is going to require us to rebuild this site from scratch. Microsoft isn’t the only source of things going wrong, we have a couple of utility add-on products that no longer seem to want to play well with others. For now, we have had to deactivate these solutions while the vendor scratches their head – hopefully this won’t lead to changes in our solutions. SharePoint solutions evolve, improve, get extended and sometimes SharePoint solutions break. It’s not all good, but it certainly seems to be something we have to get used to. Is my SharePoint thing done? “It depends on what the meaning of done is”– apologies to Bill Clinton. Why do you use SharePoint? Why do you try to promote SharePoint within your organization? Of all the very good reasons – compliance, being able to find content, supporting collaboration, communication, to save money, to improve business processes, etc. – one that is rarely mentioned is that which is expressed in the title. Microsoft doesn’t say “use SharePoint because stuff happens!” No, they say “SharePoint, the new way to work together.” I don’t think SharePoint is a “new” way to work together. It might be a faster way to work together, it might even be a better way to work together, but collaboration, communication and sharing information are not new concepts and they weren’t invented by Microsoft. In addition, SharePoint isn’t a “way of working” as much as it is a means of supporting the way you work. You build your solution on top of SharePoint. OK, I’m 144 words into this post and I’m already off-track or on-track to a different post. Let’s get back to the stuff. During the past month, several things happened in our little enterprise that people don’t consider when planning or marketing a SharePoint installation. First, earlier this week a coworker was complaining that he could not get the information he needed to prepare his 2014 budget. The information he needed is reported, but not shared. In other words, my coworker could see the information, but he could not manipulate the information. He couldn’t sort, filter and query the information. The sorting, filtering and querying is done by someone else (someone with access to a proprietary system) who happened to be out of the office. Details, deadlines, travel, meetings and personal obligations all aligned to put one person in need of information that only one other person could provide and that second person was not available. We’ve never seen the need to put this information in SharePoint, or anywhere for that matter. We don’t work together on this information; we don’t collaborate in the production of this information. We send this information around, but we don’t “communicate” over this information. On the other hand, we need this information when we need it. Those two are examples of what happens when people don’t accept that stuff happens and will happen in the future. Fortunately, that view toward stuff might be shifting toward a state where it is the exception rather than the rule. About two weeks ago, I had a discussion with someone who was complaining about A) Having to include managed metadata columns in his custom list, and B) The fact that selecting one managed metadata column by an alias can’t automatically trigger the selection of two additional managed metadata columns that respond to the same alias. (If anyone knows how to make that work, please add a comment). When I pointed out how the managed metadata terms allowed us to link this list to several other lists – easily and accurately – he shrugged. When I showed him a web part page where we bring that information together, he became convinced of the value. He knows that if that person is out, there will be no copy, there will be no email – I love this guy! He understands that stuff happens.